Now that you have entered the game, it is time to familiarize yourself with the interface. The top-header shows you various information like your league, your division and how much money you have. It will also show you if you have any unread messages, pending offers or waiting challenges. The large middle section holds the main content and the footer holds a few words about the current page and buttons to 'Help', 'Tips', 'Preferences' and the purchase-page. Please note that if you have selected the compact view, the four mentioned buttons will be part of your header in stead of your footer. Do not worry about all of this yet, but take the time to move your mouse over all our menus so you know where to find each page. The grouping of the pages is quite logical, and everything that has to do with your team, can be found in the Team-menu, and so on. As you might have noticed, the help-popup is displayed automatically the first time you visit a new page. To open it later, you must click the help-button. Throughout the game, you will encounter a lot of team-names and player-names. These are usually clickable. When you click on a player-name anywhere in the game, a window will open and show you all known details about that player. When you click on a team-name, a window will open to show you detailed information about the selected team, along with it's history, trophies and achievements. It is safe to play ManagerLeague without any pop-up blockers, as we do not have any pop-up adverts anywhere, only game-related windows that open when you click on different links. You can try this now, by going to your Team Setup page and click a player-name. When you are done, close the player-window. Now you can take a look at the team-window. Go to Data -> Tables in the menu and click on one of the team-names. When you are done taking a look, close the window. The table you are looking at here, shows you the 16 teams playing in your 'Department'. 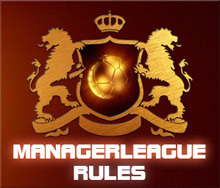 Now it is time to explain the league-system in ManagerLeague. 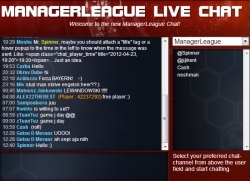 ManagerLeague has several 'Leagues'. The English League, The Swedish League, The Norwegian League and several more. In each League, there are several divisions. The top division is always division 1. In division 1, there is only 1 'Department', 16 teams in all. In division 2, there are 4 departments. As you have figured out already, there are 64 teams playing in Division 2. In Division 3, there are 16 departments, which means there are 256 teams in Division 3. And so on. As a new manager in ManagerLeague, you are probably in the 4rth, 5th or 6th division, so you have some way to go before you will be in the top division. Do not worry about that though, your team is nowhere near good enough for that kind of challenge yet. Now that you understand the basic setup of your league, it is time for the last piece of information you need before we can proceed to actually play the game. You need to know how TIME works in ManagerLeague. ManagerLeague runs an entire season in 28 days. Every fourth Thursday, the game goes from one season to the next. During one season, every team must play 30 league-matches. League-matches are played at 03:00 and 15:00 CEST. That is one league-match every 12 hours. Between matches, your team has its training-sessions. So as 09:00 and 21:00 CEST, your players will run like crazy, work on their skills and attributes, or even rest if they are tired. In ManagerLeague, we refer to something called 'a round'. A round starts with training and ends with a league-match. The main season must thus have 30 rounds. However, there are 7 extra rounds at the end of the season. We will explain why we have 7 extra rounds later, but for now, all you need to remember is that a season in ManagerLeague has 37 rounds, and it lasts for 4 weeks. In ManagerLeague, there are more than 75 Achievements. In the beginning, they are simple 'objectives', and some will give you a little reward. The first 18 achievements, all in the 'Basic' category, can be done right away. You will find these achievements listed in the red central box on your General-page. Some of them will make you look around inside the game, which is the whole point of the basic achievements. After completing all the basic achievements you will know how to send messages, add friends, list players for sale and much more. This tutorial will take you through some of them right now. Just follow the tutorial step by step, and you will learn all you need. The first achievement is called 'Hello' and the objective is to send a message to someone. Why not introduce yourself to the top-manager in your department? To do this, go to Data -> Tables, and click the envelope-icon just right of the manager-name in the table. Then you will see a message-window, and you just need to fill in the subject and the message itself, and click the send-button. The window will close automatically when the message has been sent. Then go back to the General-page, and you will notice a little note being displayed about a completed achievement, and possibly a reward as well! The second achievement is called 'Introduction' and the objective is to post a message in your department-forum. 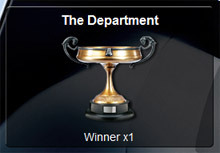 The department-forum is a forum for only the 16 teams playing in your department. You can find it by going to Data -> Tables again. Look in the top right corner of the main content. If there are no discussions there, make a new thread and post your introduction. As soon as you have posted, you will see the little achievement-box again, and once again you have earned a little reward that will help you to improve your team later. You can also find your department-forum by going through the main forum-link in the menu, under General -> Forums. Just click on the Common forum-group, and you will see it. The third achievement is called GUI. You must now change the header and footer layout, which you can do at Options -> Preferences. The fourth achievement is called 'Salesman' and the objective is to list one of your players on the market so that others may try to buy him. There are actually 3 different ways of doing this. We will pick one of them, so just go to Transfer -> My Transfers. The list on the left includes all of your players. You can mark players for sale by clicking the little plus-icon to the right of each name. Right now, it does not matter which player you list, so just click one of them. As soon as you have done so, another achievement has been secured, along with a little reward. The fifth achievement is called 'First bid', and now you are actually going to place a bid on a player. Before we do this, we need to take a look at your team and find out what you need and how much money you have at your disposal. Now you will also learn how to SACK players, as this will provide you with a little extra money. Here we assume you have just over 30 millions in your account, which is what you should have if you have not done anything else than this tutorial. Now, go to Team -> Team Setup. Your players are listed in color-groups, where each color represents a 'role'. A role can be either Goalkeeper, Defender, Midfielder or Attacker. Inside each group, the players are sorted by their 'Quality', a rough estimate of how good that player is. So your bottom yellow player is your worst midfielder. You can sack him by clicking on his name, and then click on the Sack Player button in the player-window. I now want you to sack your worst midfielder, your worst defender and your worst attacker. These players will never be good enough anyway. When you are done, take a moment to look at your team. You should probably consider to sack all players with a Quality below 60. Do so now if you wish, and click the arrow on the top to go to the next step in the tutorial. Now you need to determine what kind of player you need the most. Although there is no right or wrong here. We will be looking to buy a player with a Quality of 70, so you need to determine where such a player would mean the biggest improvement for your team. If you already have 4 midfielders with a quality of 70 or more, then you are not looking for a midfielder. And remember the saying: 'A good attacker can win the match, but a good goalkeeper can save the season!'. When you have decided what you need, it is time to find him and buy him. Before we go and buy our first player, we are going to hire a scout who can help us decide if the player has a good potential. You will actually get an extra achievement for hiring the scout, so that's an extra bonus. We will do this quickly and without a lot of detail: Go to Team -> Staff, look for (the box called STAFF-SEARCH and search for an excellent scout. Hire one. 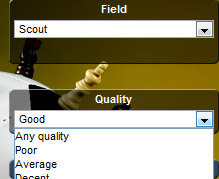 If there are no excellent scouts available, go for a very good one. He will cost you a little money every round, but he is worth it. Now we are ready to search for a player to buy. In ManagerLeague, there is a pool of players you can buy who are not yet signed with any teams. It is from this pool we will make our purchase. Buying players from this pool, has two major advantages: No-one can outbid you, and the player is free to join your team instantly! Please proceed to Transfer -> Player Search. This is where you search for players you wish to buy. Right now, we are going to fill in some numbers in the search-form, and start the search. First of all, click the button that matches the correct role you are looking for. Then, select 'Unsigned', and leave the Nationality-dropdown as it is. Then fill in 70 in both minimum and maximum quality, and 17 in both minimum and maximum age. Leave everything else as it is, and click the search-button. Your search has now been placed in the queue, and should be ready in a few seconds. Just remain where you are, and you will see the list in the top-right corner be updated when your search-result is ready. When you can see it in the list without the '...' in the name, click on it, and the search-result will be displayed. You should now see a whole selection of 17-year olds who all have a quality of 70. Now you are going to spend some more money, and put your newly hired scout to good use. Click on the first player in the search-result to open the player-window. You should see a Scout-button towards the lower left part of the player-window. Click it once. You should see a result immediately, some stars. The maximum is 5 stars, the minimum is half a star. Ideally you would want a 5-star player, but there might not be any for sale. At this stage, anything at 4 stars or above is good enough. One thing about scouting unsigned players is of course that the scout has very little information to base his rating on. But as long as we see 4 or more stars, we can feel confident the player has decent potential, which is good enough right now. You can scout a player multiple times and look for an average rating, but this costs more money. It might be worthwhile, but then again it might get very expensive. The choice is yours. When you have decided which player to buy, it is time to place the bid. Unsigned players will always be sold for their 'value', so this is simple: Click on the players name to open the player-window, then click the Place Bid button. The amount has already been filled in for you. As long as No-one else has just purchased this player while we have been busy scouting him, he should be in your team as soon as you click that button. If you get a message about the player no longer being for sale, you have to find another player. When you are done, you will see the nice achievement-box pop up again. Congratulations, this one was truly deserved! You can now go back to your Team Setup, where you can see your newly purchased player in his rightful place in the list. Not only did you place your first bid, but you also completed your first buy, which gave you yet another achievement. Go to the General-page again, and look for the next achievement. The next one should be called Basic Trainer, and your objective is to modify the individual training for one of you players. Go to Team -> Training and just look for a minute. At this point, it is time to learn a little bit about player-attributes, or 'stats' as they are often called. Each role has 1 primary stat and 3 secondary stats. If you look carefully in the list of players on the training-page, you will see that some stats are written in bold characters. These are the primary and secondary stats. The stats you see printed in green, are the ones they are currently set to train during the next training-session. In order to complete your objective, you just need to click on any white stat with any one player. So, to change what a player should be training, you simply click on the stat. As you can see it turns green, which means the training-change has been implemented. You will also see the achievement-window again, congratulations. When you set the individual training for each player, keep this in mind: Low stats are easier to train than high stats, and bold stats are the ones the players will have most use of in an actual match. As you are now looking at the training-page, there is one thing you should learn about right away. The stat called fitness is not a stat like the others. Fitness shows you how 'fit' the player is. All players have a max fitness of 100, which indicates they are both uninjured and ready to play a match. The further he is below 100, the worse he will perform. If fitness drops below 80, the player is considered 'injured' or 'too tired to play'. As a manager, it is your responsibility too decide which players should rest during the next training-session (to regain more fitness), and which should be allowed to work on their stats. As you can see, there are some handy buttons at the bottom of the player-listing here. The next achievement is called 'First League Win'.This one you should be able to manage on your own. You can view any match-report in the game by clicking on the result. The next one is called 'Lineup-tweaker'. The objective is simply to change your lineup in the Team Setup page, and save the new lineup. You can click on players in the list to the left (clicking on their names will bring up the player-details in stead) and then click on the position on the field to the right to place them there. When it comes to changing responsibilities, you can click on a player on the field and then click on the responsibility you wish to give him. That hint should get you through the next achievement as well, which is called 'Freekick-taker'. At this stage, you should know enough to finish the rest of the basic achievements on your own. 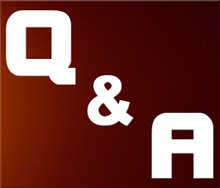 If you get stuck, there are forums in several languages where you can ask questions. You will receive help and replies very quickly. Your department-forum might also have other new players who might have similar questions, and you might be able to help each other. The tutorial will now move away from achievements, and on to other things you might want to know. The time has come to change your entire lineup to your best possible setup. Go to Team -> Team Setup. First you need to decide which formation you wish to use. This can be based on pure passion, or you can take a look at your players and see what formation your players would fit the most. 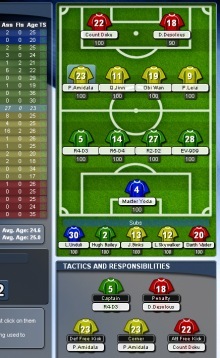 If you have a lot of good attackers, 4-3-3 could be a better alternative than 4-5-1. If you have a lot of good midfielders, then maybe 3-5-2 is a good choice. 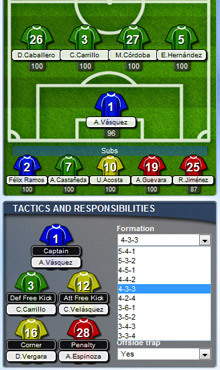 When you have decided on a formation, select it in the formation dropdown and click the long button under your player-listing to save your setting. Now you need to drag the best players you have onto their matching positions in your selected formation. Drag midfielders to the midfielder-positions and so on. When you are done, click the long save-button again. Also, you should click the button that stores this setup as a template for easy recovery later. The button can be found under the long save-button, and it should have an arrow pointing downwards and a big number '1'. This is also a good time to consider which tactics to use. I would recommend starting with Tackling set to Soft tackles, as it will help you avoid injuries early on. You have an inexperienced team right now, so playing it safe can be worthwhile. Remember to use both save-buttons again after making changes to your tactics if you wish to keep the settings. If you have not yet picked a sponsor for your team, it is time to do so now. Go to Economy -> Sponsor and pick one. The number of available sponsors will decrease as a season progresses, but there will always be some choices available. As a new team, you might want to go for one with a fairly good Upfront-value. Your economy is rather weak at this stage, but that will improve with time. Some sponsors have a lower guaranteed amount, but higher bonuses. Others are more safe. You need to decide for yourself which one you want. Please note that you may not change sponsor until the beginning of next season. You should put your money to work for you straight away. Go to Economy -> Stadium and increase your stadium-capacity. It is very important that you do this if you wish to build your economy, and you really do! It is important that manage to have a double focus in the time to come. You need to both keep building your economy, by upgrading your stadium, at the same time as you are developing your team. A new team is not hard to improve, but if you want quick results you need to train them hard. this means that you need to play friendlies as often as you can, as long as you have credits available. There is no doubt that a fresh team has a lot to gain from playing many friendlies, and you should seriously consider purchasing some credits (yes, even if it costs you a buck or two of real money!) to get quicker results! It is a known fact that most people are skeptical about spending real money on webgames, but we promise you it is well worth it. All new users get 50% extra credits with their first purchase too...Consider it carefully, even 20 extra credits can make a big difference! As a new player, you might not know a lot of people in ManagerLeague yet. By using the forums on a regular basis, you can both learn a lot AND make new friends. You could always invite some friends to the game as well, and you will get a free credit for each friend signing up, plus 10% of any credits they might purchase! It is always a lot more fun to beat someone you know! You will need some patience when playing ManagerLeague. It will take a long time before you have a team that can compete in the highest division, several months for sure. Even so, you will soon learn that it does not take long before your team starts improving. Hang in there in the beginning, and your patience will be rewarded. You can find the rules here. With the rules out of the way, it is time to look at some at some typical questions and answers, to save you a little time. Proceed to the next page of this tutorial. What are the international and national leagues? In the international league there are managers from all over the world, while in a national league only managers from a specific country is allowed. Not all countries are present in national leagues just yet, but as the game continues to grow more nations will come. What are credits for, and how can I get them? Inside ManagerLeague, credits can be used in many ways. You need credits to play a friendly on your home court, you need credits to create or join cups (unless they are free), and it requires credits to send your team on a training camp, etc., etc. Each season you will get 15 credits for free, but if you want more of them they can be purchased safely inside the game at Options -> Purchase Credits, and continue from there. How can I change credits to cash, and opposite? Go to Options -> Preferences, look for Credit Exchange. When are training camps held, and how can I arrange one? Training-camps are held every Sunday afternoon at 18:00 CEST. In addition, there is on extra camp on the last Wednesday of the season, still at 18:00 though. You can order training-camps from the Training-page which you can find in the Team-menu. The cost will vary a great deal based on your selections. Training-camps cost 2 credits as well, not just the money. What are player-cups, and when are they played? Player-cups are cups made by the players themselves. Whoever creates the cup is free to set different requirements for the cup, like which league or divisions may join. There is a cost involved in playing player-cups, but there is a lot of potential extra income too, not to mention the benefit of extra experience for your players! These cups are played during the weekend, either on Saturday or Sunday. The draw will happen at 12:00 CEST, and from there matches are played every half hour. What are official cups or tournaments? 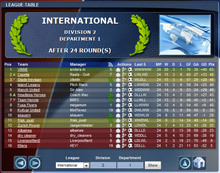 In ManagerLeague, we have 3 official cups: The League-Cup, The Department-Cup and Champions League. The League-cup is played by all teams in divisions 1-4. The Department-cup is played by all teams in divisions 5-6. Champions League is played by those who managed to qualify for it the season before, by ending up at the top of the leagues. Player-awards are awarded towards the end of a season, to players who have performed superbly. The Platinum Boot : The top scorer in every LEAGUE. The Platinum Ball : The best performing player in every LEAGUE with at least 20 of 30 games played who did not get The Platinum Boot. The Golden Boot : The top scorer in every department, who did not get any of the Platinum awards. The Golden Glove : The best performing Goalie in every department who has played more than 20 of the 30 league-games and did not get any Platinum awards. The Golden Ball : The best performing Defender in every department who has played more than 20 of the 30 league-games and did not get any Platinum awards. The Golden Statuette : The best performing Midfielder in every department who has played more than 20 of the 30 league-games and did not get any Platinum awards. The Silver Boot : The best performing Attacker in every department who has played more than 20 of the 30 league-games and did not get any Platinum awards. The Silver Cap : The best performing 17 year old in every department who has played 20 of the league-games and not gotten a Platinum award. In addition, to get an award, the player must not have been bought or sold after the first league-match of the season. Allthough cooperation is not important, the social aspect of the game has much to offer. Getting to know other players in here will enhance your experience playing the game. It is a lot more fun beating someone you know. Being present in the chat and in the forums and making sure you fill up your friendlist, will also increase your chances to be invited into some of the cool cups that are arranged by other players. Also, knowing other managers will make it much easier playing those SETS (use 1 credit to challenge someone to a friendly and have them challenge you back, giving you twice as much for your money!). Since this tutorial is now over, why not try the chat right away!